//]]> ! ★Nail Art Couture★ ! : Followers Appreciation Giveaway! Winner: Congratulation to HELEN W! Whether you follow my blog and my nail art posts through GFC, HelloCotton, Facebook, Twitter, or Instagram, I just want to thank you all for your support and kind comments. On November 30 will be my 1 year Blogiversary! I remember calling my friend Katrina out of the blue and telling her, "I think I'm going to start a nail art blog". When I first started, I was a bit shy at telling people about my blog, especially my personal network of friends and acquaintances. But once it gained momentum, gained a decent number of followers and attracted several hundred page views per day, I became more proud of my little website. Anyways, I wouldn't have kept this blog up if it weren't for the readers coming on here to check my stuff out. So a big thank you goes out to all of you. Yes, the Crimson Amulet Palette was given to us in our September Canada Glossybox. I'm slowly trying to use up all my make-up that I already own and I know I won't get to this palette for a while. Since I know I won't get around to using it, perhaps one of you will! In addition to the palette, I'm going to throw in one of my favorite products, a classic pink Travalo (perfume atomizer), as well as a color changing nail polish from Del Sol! The Crimson Amulet Palette ($25) is inspired by the movie Dark Shadows. It comes with 24 eyeshadows, an eye shadow base, an eyeliner, 3 blushes, a highlighter, and 4 lip glosses. 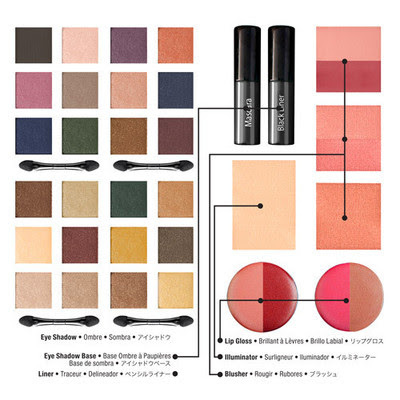 This is a great travel palette to bring around with you! If you're unfamiliar with the Travalo ($16), it is a perfume atomizer that allows you to store your favorite perfume. Honestly it is the best thing ever just because before that I would buy the rollerballs and that can be quite expensive. You simply fill it up by removing the perfume spray cap and pumping your favorite fragrance through the bottom of the Travalo and away you go! I carry around 3 with me at all times just to change it up throughout the day. Finally, the I love Del Sol polishes ($10), even though we're losing sun here in Canada, it's always super sunny else where right? The polish that I am giving away changes from blue to purple. It's super fun! Anyways, good luck and thank you once again for dropping by my blog! You must answer the first two questions and follow my blog through GFC. Any entries that do not follow this will be voided. Any imcomplete entries will be voided. This giveaway is open to all international followers of my blog. You will gain an additional 5 entries for any person who enters through your referral link. There was no space to enter the second answer in the Punchtab. So I'm answering here. :) Hope that's ok? my user is achan81997. i would love to see edgy and more flashy nails using dangles? i saw a girl with a dolphin hanging off her nail! I would like to see some halloween nail art. Congrats hun! I couldn't enter for some reason.. kept saying Giveaway not Found when I went to go to the second question :( Oh well! What the heck!! I was testing alternatives to Rafflecopter. No worries though! I'll make a note of it! My GFC is Candice and a nail idea I have for you is fruit salad, each nail looking like a different fruit! My GFC name is Linda V. I'd love to see some metal spike nail art for a funky punk rock look. MY GFC name is Natalie, I'd love to see a nice metallic chevron nail look! Here's my blog, would be awesome if you stopped by~! I followed via GFC as Linda Y.
I'd love to see something that is matte polish followed up with a some glitter. A cute thanksgiving themed nail design! Hmmm, I'd love to see some simple designs but the trends are still visible. Id love to see cute halloween nails or colors with designs..thanks for the contest! I'd like to see guinea pigs - I did them once and they were a real challenge, and not many other people have done them! Tutorials would be great to see. 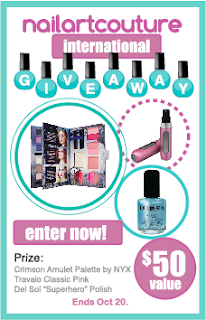 MMsMommy10 or mileysmommy10@gmail.com :) This is a super exciting giveaway!!! I have been trying to accomplish music note accent nails and have been failing horribly. LOL would love to see those. I always love to see new tutorials. I just recently found your blog through Julep and I love your manicures! no worries, i'll just add you in manually. Trying a new giveaway app to see if I would like it. Never knew they had so much kinks! Sorry about that! Love your giveaway! Love to see more nail art using microbeads other than cavier nails! I'd love to see a cute Christmas nail art! haha... you must be a new reader. Majority of my nail art are fashion inspired. But I don't think I've done anything "crazy". Interesting. Do you mind sending me a link of what you may be referring to? I would like to see more goth nails! I'd like to see some striped nails. I would love to see halloween pumpkin nails!